Skamp Industries has changed its task of being an equipment manufacturer to one of a supplier of service parts for the products we manufactured. We have ceased our manufacturing activities because of the availability of major production components. 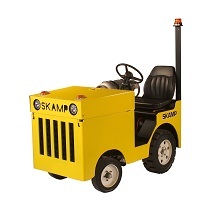 Skamp will supply service parts for all models manufactured for the past 20 years. Our parts inventory has been moved to a new facility. We have inventory for older and newer models plus vendors who are able supply us with any and all parts that might be needed to repair your unit. Parts books, product information and product literature are available on the web site for your reference. Feel free to print this information for your reference. Service manuals are also available from Skamp Industries for all models. Get in touch with us (269-731-2666) or send us an email (mduggan@skamp.us) and we will be glad to supply any parts or answer any technical service questions you might have about our products. Introducing a New Engine for our Full-line of Tow Vehicles in 2004. If you have any questions regarding our products, pricing, or to locate a SKAMP dealer in your area, please Contact Us.